Skipping my review of Billions Season 3, Episode 9, “Icebreaker” this week due to a late night spent with a passel of tweens at the Taylor Swift concert. My girl’s first big concert! In lieu of my hoity toity ramblings on the meaning of it all, and since the show itself brought up the subject, here’s another revisit to a perennial favorite around here: Damian as Steve McQueen. Chances grow slimmer by the day that this project will ever get made, but it sure was nice to imagine! If you missed the connection to Billions, here’s a gif reminding you of Krakow and Bobby’s oh-so-adorable nicknames for each other. Bullitt is the story of a San Francisco police lieutenant played by Steve McQueen. See, even Krakow sees a resemblance. The most bittersweet thing about fandom is that for all the imagining you do, visualizing your fav in roles you’d love to see him in and even writing fanfic (if only in your head) putting him into new and interesting situations no writer on the payroll ever thought of, chances are pretty high that your dream will never come to pass. There’s a machine at work making projects happen or not happen, a machine that responds to (or shrinks beneath the weight of) a lot more stresses than just the wishes of ardent fans. So, it has perhaps come to pass with the subject of this post. Since I first wrote this, chances have possibly become slimmer that the powers that be will ever get their requisite ducks in a row to make this happen. Still, Damian Lewis as Steve McQueen is a pretty picture, one not easy for a fan to let go of. The head of the production company with rights to Steve Terrill’s biography of Steve McQueen, Graham Kaye, has stated online that the cast and director of the film is to be announced at Cannes. Now, he didn’t specify which year, and, last we heard, they were still looking for a screenwriter. I’m reading Terrill’s book and I can tell it’s not going to be an easy one to translate onscreen. It has a deeply psychological focus and follows McQueen’s life in terms of not just events, but his emotional growth, or lack thereof. Steve McQueen was a troubled young man. He grew up basically on his own, his parents either absent or grossly unreliable. He stumbled into acting almost accidentally, and though he was drawn to it and wanted to keep doing it, he never quite took it seriously as a profession. Or rather, maybe he took it too seriously, as the one and only life boat he had, the one and only thing he could do well enough to get the attention and approval the boy in him desperately needed. 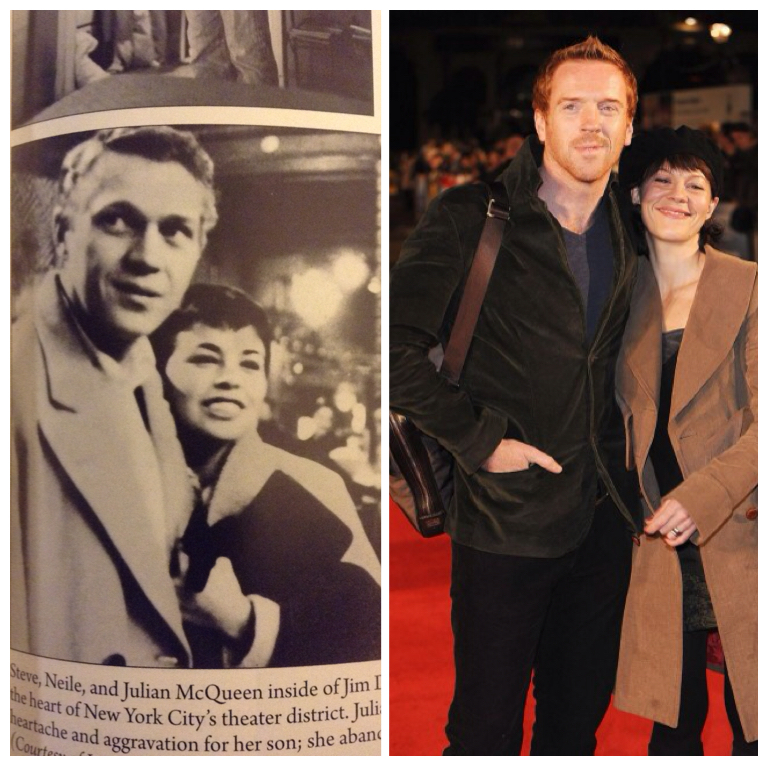 Steve McQueen’s upbringing and his experiences as an actor could not be any more different than what we know of how Damian Lewis was brought up and came to the profession. 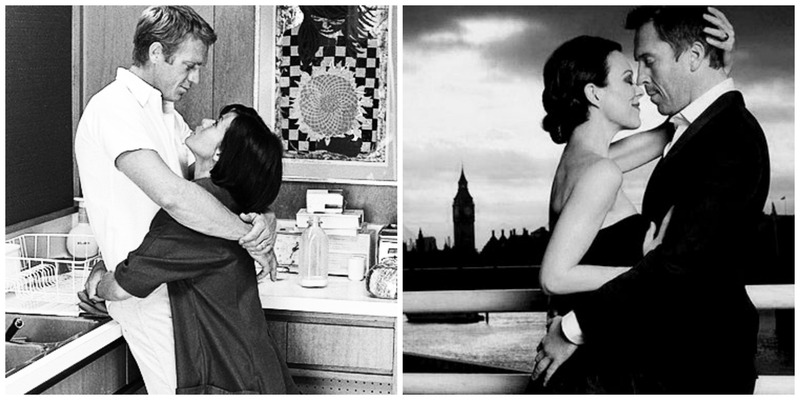 In this respect, McQueen and Damian Lewis are polar opposites. Nonetheless, we’ve seen what Damian Lewis can do with playing emotion. We’ve seen, most recently as his turn as Henry VIII, what Damian Lewis can do to show subliminal damage and the armor a man builds up to protect himself from himself. 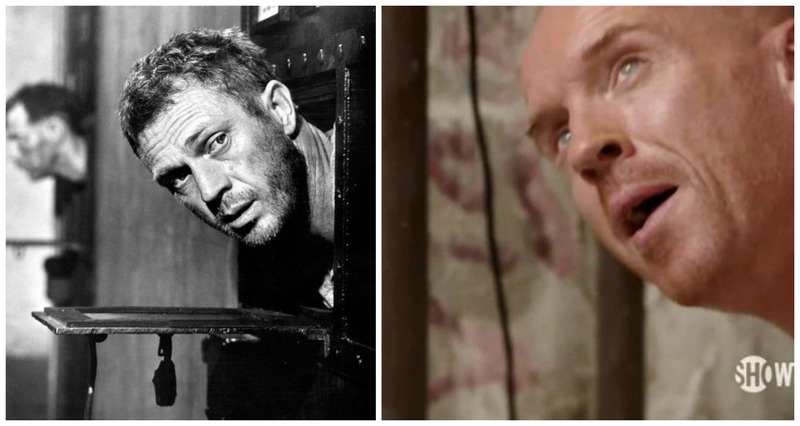 Graham Kaye has hinted that this new story about McQueen will disclose something new about his life, something that didn’t become common knowledge even after he died. I haven’t gotten to that part in the biography, but I can intuit by Kaye’s and others’ description of that event, that if Damian Lewis gets his hands on the material there’s no telling how far he’ll take it. 1) Because he can. Damian Lewis can play American flawlessly. He can play repressed damaged Americans even more flawlessly. He makes the effort to thoughtfully understand the psychology of the roles he’s playing. He has an organic “real” look to him, coupled with an unparalleled plasticity, which allows him to become ANYBODY right before our eyes. 2) In their most notable roles, both Damian Lewis and Steve McQueen have played soldiers, prisoners, men on the fringes of polite society. 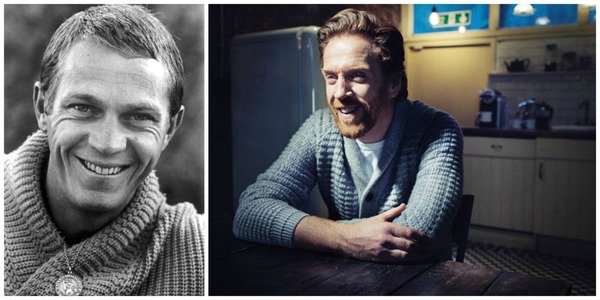 Both Damian Lewis and Steve McQueen like cars. 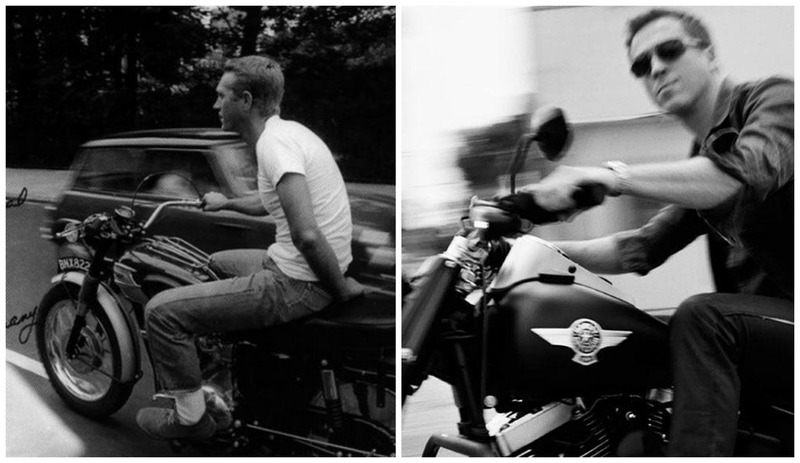 And they both look great on motorcycles and behind the wheels of nice automobiles. 3) Damian Lewis has freckles! He has vivid blue eyes, the same ruddy complexion, the same hair. He’s the same height. (okay Damian is 3 inches taller, but who’s counting) Of course, playing a historical figure is about more than physical resemblance. But, you have to admit: here, the resemblance is extraordinary. They also seem to have the same sense of style, the kind that never goes out of style. 4) They even have the same slack-jawed expression when they look at the women they love. Out of context, this sounds like a brag. It may be, but, darn if it ain’t the truth. Damian Lewis knows himself. He doesn’t have an “oh shucks” attitude about where he’s landed. Sure, a lot of success is sheer luck and being at the right place at the right time, but Damian Lewis seems like a bloke who has the self-knowledge and insight to know what kind of roles he is drawn to and made to play. 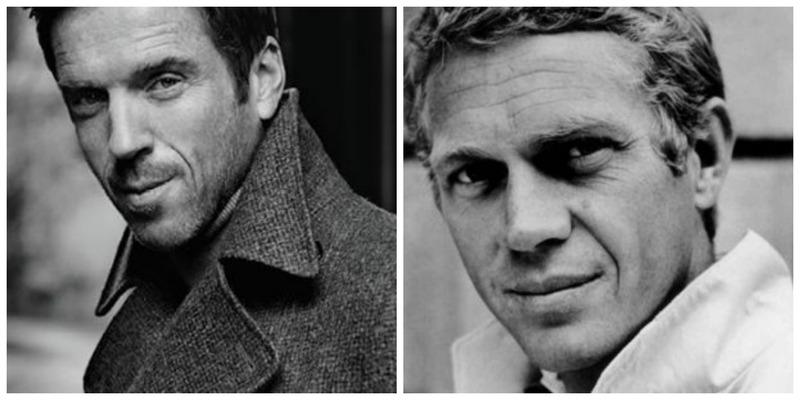 Ergo, let the evidence show, the role of Steve McQueen is one that Damian Lewis is made to play.